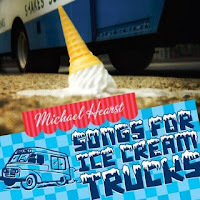 I recently had the pleasure of interviewing Michael Hearst of Brooklyn band One Ring Zero about his new album, "Songs For Ice Cream Trucks," for Venus Zine. Doesn't the title make you curious, and hungry? "When Michael Hearst sticks his head into his Brooklyn freezer to report on its contents, he notes a bottle of gin, lots of coffee, and a bag of lima beans. There are plastic containers of six-month-old homemade chili and chopped herbs for the next time he needs a pinch of fresh cilantro — à la Martha Stewart, he says..."
To find out what else is in Hearst's freezer, as well as more info about the album, why Lemony Snicket and Michael Chabon are blurbed on its cover, and where to find some of NYC's best ice cream, click here.